Market Meditations is a podcast about innovators, entrepreneurs, academics and the ideas within the movements they're building. Each featured episode is marked with introspective insight, humor, and serendipity during conversations with influencers of some of the world’s best known financial, health and life sciences sectors. Hosted by Chris Haydel, Partner at HBAWealth and Neal Mody, Managing Director at Zoic Capital. Chris Haydel is currently HBA Wealth’s managing partner and senior financial advisor. Chris relies on more than 25 years of experience in the financial services industry to help clients improve cash flow, benefit from unique pension strategies and enjoy optimized investment selection and portfolio design. He specializes in pension and retirement planning, tax efficiency and goal, portfolio and investment analysis. Neal Mody is the founder and managing director of Zoic Capital, a venture capital firm focused on innovations at the intersection of life sciences and medical technology. Zoic partner’s with early stage companies with innovations to accelerate the potential to fundamentally change our experience with healthcare. Having previously founded a successful semiconductor company he mentors, invests and catalyzes many more. Neal has an interest in studying mastery learning principles and inorganic growth, effectively applying both to life and business. Joshua Gans is a Professor of Strategic Management and holder of the Jeffrey S. Skoll Chair of Technical Innovation and Entrepreneurship at the Rotman School of Management, University of Toronto (with a cross appointment in the Department of Economics). Since 2013, he has also been Area Coordinator of Strategic Management. Joshua is also Chief Economist of the University of Toronto's Creative Destruction Lab. He most recently co-published, Prediction Machines, The Simple Economics of artificial intelligence. Named one of 10 Women to Watch in Tech in 2013 by Inc. Magazine, Vivienne Ming is a theoretical neuroscientist, technologist and entrepreneur. She co-founded Socos, where machine learning and cognitive neuroscience combine to maximize students’ life outcomes. Vivienne is also a visiting scholar at UC Berkeley’s Redwood Center for Theoretical Neuroscience, where she pursues her research in neuroprosthetics. She sits on the boards of StartOut, The Palm Center, Emozia, Engender, and Genderis Inc., and is a Chief Science Advisor to Cornerstone Capital, Platypus Institute, Shiftgig, and Bayes Impact. John Milne is a physician executive, strategic thinking partner and healthcare futurist focused on the development of innovative care delivery systems, advanced facility design, and cutting edge clinical technologies. Partnering with forward-leaning designers, developers and entrepreneurs to accelerate the impact of human-centric wellness-focused strategies that transform the built environment and foster technologic innovation. 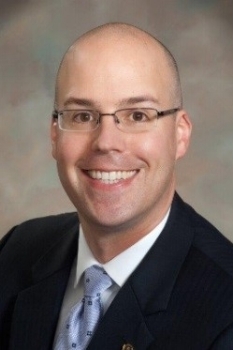 John is currently the Senior Vice President, Real Estate and Construction at Providence St. Joseph Health. Steven Stack is an experienced emergency physician and policy advocate within the hospital & health care industry. He was the first emergency physician ever elected to the American Medical Association (AMA) board of trustees, subsequently serving as board chair and as its youngest president since 1854. Dr. Stack has special expertise in health information technology (IT). He is a nationally recognized advocate who bridges front-line clinical care with state and national policy related to heath IT and served on numerous federal advisory committees for the Office of the National Coordinator for Health Information Technology (ONC) from 2010 - 2016.